The Talbot model has 3 Beds and 2 Baths. This 1456 square foot Double Wide home is available for delivery in Texas, Louisiana, Arkansas, Oklahoma, Mississippi & New Mexico. The well-proportioned Talbot is guaranteed to please even the most particular home buyer. The expansive living room works well with the open kitchen/dining area and the resident chef will be pleased to find all the amenities necessary to cook a hearty weeknight meal or holiday feast. Note the convenient island, pantry and modern appliances. The private master suite features a rather large walk-in closet and fashionable bathroom with dual sinks and a 60” garden tub. Ask your housing consultant about the extensive list of options that are available with this model. Ask your housing consultant about the other great features that come standard on the Talbot manufactured home. 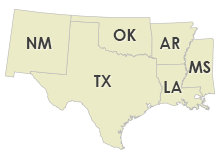 This Factory Home Centers location delivers our finely built Champion Homes to Texas, Louisiana, Arkansas, Oklahoma, Mississippi & New Mexico.